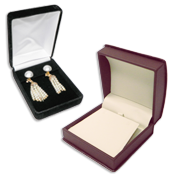 Shop our fancy collection of Earring & Pendant Boxes and find vintage-like pieces for your store! Discover boxes made of leatherette, acrylic, velvet, wood, paper & cardboard in many styles & colors, such as blue, black, white, red & clear. Magnetic boxes available, perfect for packaging & retail jewelry sales. Get the best deals thanks to our wholesale discounts!